You could soon be able to buy music on an iPhone or iPad without needing an internet connection thanks to Apple's latest patent. 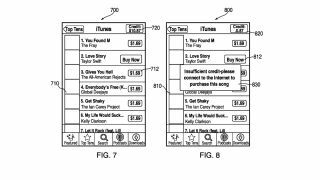 The new patent would see iTunes storing top recommended songs to your phone, tablet or computer, but keeping them locked until you click 'buy'. To buy the songs, you'd need to have pre-paid credit on your account - if not, iTunes will tell you "Insufficient credit - please connect to the internet to purchase this song". The number of songs stored on your device ready in case you feel like buying them will depend on both the amount of credits you have pre-paid for, and the amount of space you have available on your gadget. Obviously you'd need an internet connection to your device at some point - be it a phone, tablet or computer - but you could feasibly buy new music when you're on a plane or underground. We sort of remember a time when not needing an internet connection to buy music was the norm. We think there might have been some kind of street in the middle of every town where you could go into a specific building and swap money for music without any kind of access to the information superhighway, but it's a bit hazy. Who knows when - or if - Apple's latest invention will make it to our iTunes accounts - could it be a feature of the supposed iRadio streaming service that's supposedly set to launch soon? If so, memo to Apple: we'd like to see the songs iTunes chooses to offline for you be based on your listening habits rather than being just generic chart-fodder as the images seem to show. Still, it'll be good to know that if there's a nuclear winter and the internet goes down forever, you need never be without The Fray's chart-bothering You Found Me or the latest heartbroken missive from Taylor Swift.